On the evening of Thursday 5th November 2015, the doors of Mogalakwena Gallery, 3 Church St., Cape Town, opened for the viewing of Double Vision, a fibre art exhibition featuring the work of Odette Tolksdorf and myself . The opening was part of the First Thursdays, Cape Town programme, and because we were blessed with warm, balmy weather, the crowds thronged the streets and we had a really interesting mix of people coming through. “When Odette phoned me about a month ago, to ask me if I would open her and Sally’s exhibition I was at first shocked that she asked me, after all these artists were already famous and were part of that crowd that I looked up to and admired from afar while I still marveled over log-cabin patterns… I am immensely honored that they asked me to open their exhibition. 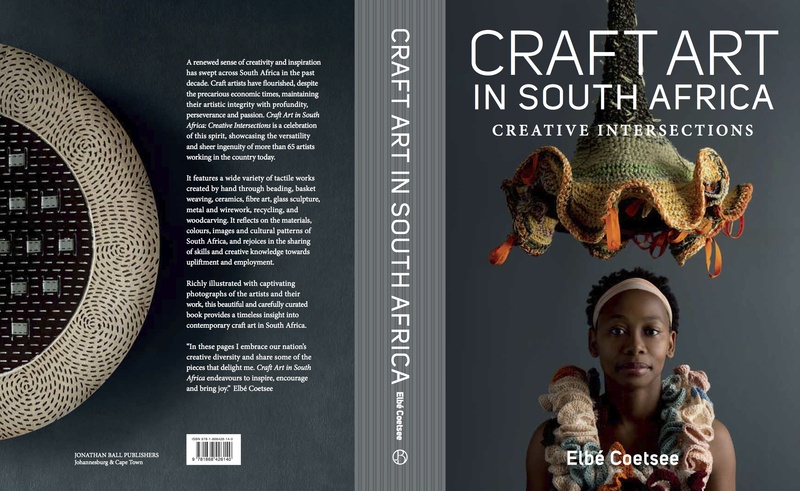 Both artists have resumes as long as both my arms…prestigious awards to their names…their work is held in public and private collections – locally and internationally…and their art-works appear in many publications …most recently in Elbe’s new book Craft Art in South Africa. 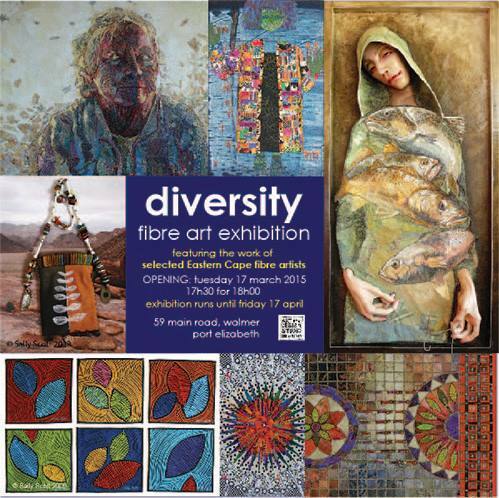 Sally Scott and Odette Tolksdorf are amongst a group of a few local textile artists who have put South African Fiber Arts on the world map. 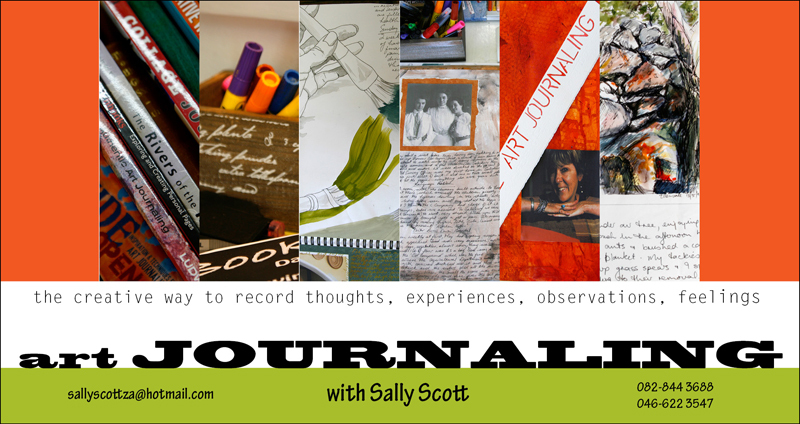 There are certain parallels to their biography…both have lived elsewhere for much of their formative years…Odette in Australia, Sally in Zimbabwe…both are internationally exhibited artists and both are teachers of creative workshops for over thirty years… both work with needle and thread amongst other things… and they are friends. While each one developed their own style and working methodology…here in this exhibition they joined forces to give us a glimpse into their practice. I will first speak about Odette, as her work is exhibited in the first room. 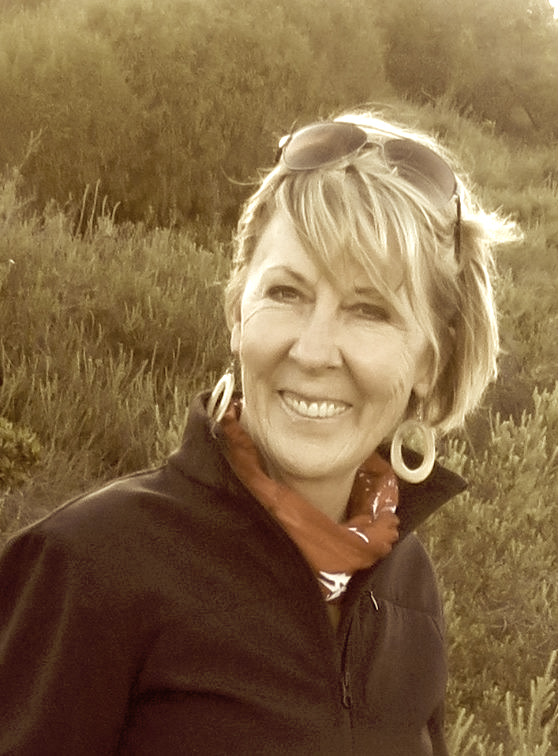 Odette, beside being a prolific textile artist, is also a Quilt Judge and these past 15 years has been the South African representative and co-coordinator of the World Quilt and Textile competition which is held annually in the USA. She has also for the last 15 years, organized cultural art and craft tours to South Africa, together with American textile artist Nancy Crow and Canadian artist Valerie Hearder. Odette’s fiber art is known for its vibrant colours, it’s geometric shapes…intricate textures… and has a linear quality about it. Her work starts often with a traditional pattern which she then distorts and adapts to fit her design concepts. Her surroundings frequently provide the prompts for her work. …a trip to Morocco becomes Lost in Marrakech…which hint at the intricate networks of Medinas and Souks…which invite one to get lost in while absorbing the colours and shapes of the place…next to it is the work Endless Migrations which is based on rumination around friends leaving the country…and the coming and goings of people in general…all over the world… in one direction or another… like the flow of water…the circles representing the endlessness of this pursuit…given the present situation in Europe with thousands of refugees making their way through different countries in search for a safe place and a new start, this work could not be more current. As a graphic graduate, Design is a strong element in Odette’s art. This is quite evident in many of her works…such as the piece Isihlalo – the Chair, which is based on the woodcarving of a back-rest belonging to a Zulu-King…. Raw Wall based on traditional Yoruba house decorations…Re-mix Africa…a lighthearted play on words referring to the watershed exhibition Africa -re mix…where Odette mixes Kimono shapes with African wax prints with a variety of textures, such as Cuba cloth, and Bark cloth…linking different symbolism and agendas. Odette’s latest works, Breath I, II and III is unusual perhaps in its soft watercolor feel…but then on closer look it is again indicative of her way of responding and processing her surrounding…as by her own admission, she was seduced by the material when she found that wonderful organza and thought of a way to use it. An artist will always read any material or subject matter through his or her own lens of seeing the world…in this case, turning layers and layers of translucent textiles into a meditative study on light and breath…offering a though provoking reflection on the repetitiveness of the sewing process. Double Vision …the title of this show….refers to an eye condition, Wikipedia informed me… (I could not resist) whereby the eyes when looking at a single object, see it twice, the effect is like squinting. I like this title for the Sally and Odette’s exhibition, as it not only points in a humorous way to two artists having different views, but it also reminds us that there is always another way of looking at things. That there is the actual artwork the viewer sees when entering the gallery, and then there is the story behind each work…the story that triggered the work in the artist as well as the ‘threads’ that are spun in the viewers imagination while looking at the work. Nobel Peace Laureate Eric Kandel, speaks of the beholders share which completes the process between artist and viewer. Which really tells us that something is happening to us while we are viewing an artwork…and the thoughts triggered have less to do with the actual work then with our own inter psychic realities …such is the power of art. When I look at Surrender, I see the threshold that allowed the other works to surface. Art and healing go hand in hand. Nietzsche already said, that when the soul is in distress, art comes as an expert healer and sorceress, turning difficult thoughts and emotions into something that can be looked at, and talked about. 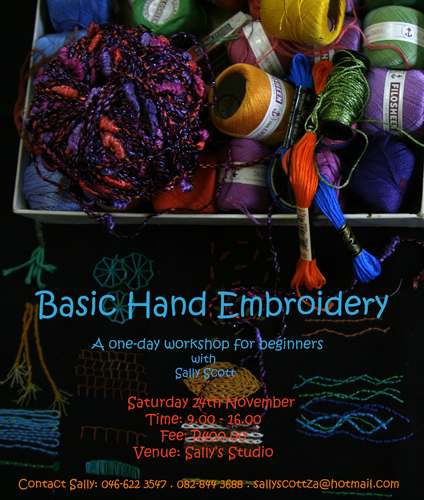 Sally runs workshops for community projects and university students, teaching embroidery skills, drawing, journal writing and her hugely popular Red Shoes workshops, which are aimed at empowering people through helping them find their own creative voice. Sally is not only a teacher and lecturer and a leading figure in the textile world, she is also a landscape painter and wildlife activist. Growing up in what sound like a magical time on a remote farm in Zimbabwe, her love for the bush is evident in her photographs and paintings. Here in this show, in the three framed works showing photographs of barren landscapes over which hang little Travel Bags combine her love for remote places, traveling and needlework. It is again the search for oneness that I see in it. ‘Evening Stroll’ by Sally Scott. 30cm x 30cm. While both artists focus on their respective tasks and work with the same medium, needle and thread, their artistic output, copious as it is, is quite distinct from each other. While Sally works with her own hand-dyed fabrics and thread onto black cloth and frequently includes text and found objects in her work, Odette’s clear lines and textures as well as her choice of strong colours, on the other hand conjure up a light filled high spirited Lebensfreude. While ‘double’ refers to the two streams of artistic output, ‘vision’ here speaks less of the actual mechanics of our eyes, but rather it refers to the farsightedness in both artists as they impart their skill and knowledge through their teaching, ensuring the spreading of a wellbeing through creative empowerment. The exhibition remains open until 18th December 2015. Please visit and enjoy!